Awful Bad: FLOWER HAIR CLIPS AND BOW Clips. Custom. Unique. FLOWER HAIR CLIPS AND BOW Clips. Custom. Unique. theAd>> I make flower hair clips + Bow clips. 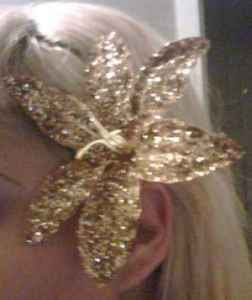 Email me for q's,make a custom order (want a purple or red glitter flower clip? ), etc.The flower clips take 2-3 days to make depending on how busy I am.Glitter Flower:$10.95. Q. "(want a purple or red glitter flower clip?)" Why? Cause "glitter is the herpes of craft products" [Dimitri Martin]. I would be picking glitter out of the nooks and crannys for the rest of my life. I do appreciate the truth in advertising. It states "Unique" and "Custom" I believe these statements to be accurate. Best in this case to stay away from words like attractive and desirable. It is neither.